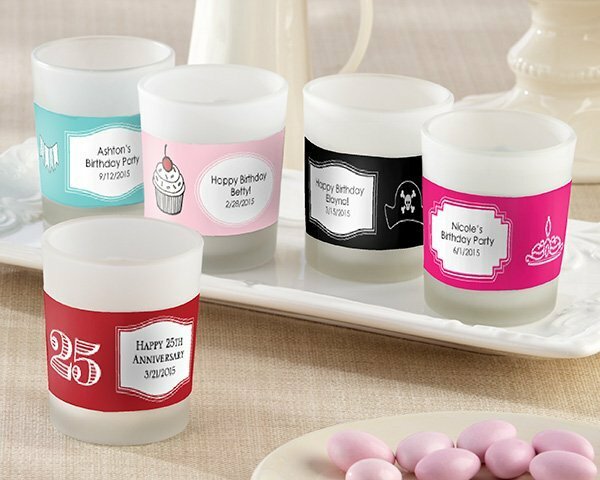 These delightful little frosted glass birthday candle favors are a great way to thank your party guests for sharing in your special day. The 2.75" tall by 2" diameter candle holders include a tea light candle and each one arrives in its own drawstring organza bag. 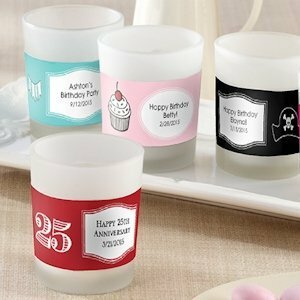 You can optionally choose to personalize the candles by adding on the labels for a small fee. Labels must be adhered to the candles so some assembly will be required. They come in numerous designs and colors so you can choose something that fits your theme and color scheme perfectly. Great for Sweet 16, Over The Hill, First and 15th birthday parties!